Will Jesus be buried next to Muhammad in Medina? 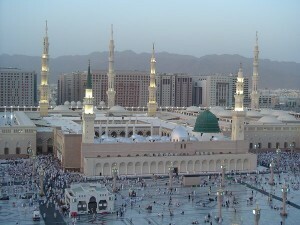 Muhammad is buried in Medina, Saudi Arabia. While Muslims do not believe Jesus died on the cross, they believe Jesus will one day return and be buried next to Muhammad in Medina. Traditions (ahadith) 1A hadith (plural ahadith) is an account of what Muhammad said or did, or of his tacit approval of something said or done in his presence [Encyclopaedia of Islam] that Muhammad taught about Jesus’ future return and death. Muslim pilgrims entering to Masjid al-Nabawi (Prophet’s Mosque) for the noon prayer. Is the evidence that Jesus will one day die and be buried next to Muhammad in Medina historically credible? No. The historical fact is that Jesus died on the cross and rose again from the dead. Jesus’ tomb was empty, just as He said it would be. The Christian hope is unlike other types of hope that end in death and burial (Psalm 146:3). Christian hope is living. Jesus’ tomb is empty. Jesus now sits at the right hand of God and reigns as the Christ.3The Bible’s references to Jesus as the “Christ” is a reference to His death on the cross, resurrection and ascension to the right hand of God (Psalm 2; Acts 2:32-36. 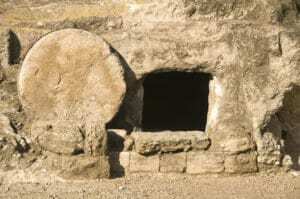 Put your faith and hope in Jesus, because His tomb is empty. We know what happened in history to Jesus. Do you? 3. ↥ The Bible’s references to Jesus as the “Christ” is a reference to His death on the cross, resurrection and ascension to the right hand of God (Psalm 2; Acts 2:32-36. Good day…I have a problem with the Quran…I have to concede that I am not at all versed in this book, but if one even find one contradiction,that is enough for reserve… One such contradiction is right here:… ‘He will destroy the Antichrist…’. How can the Antichrist be important to Islam if Islam don’t except the CHRIST? The other:…’Allah will perish all religions except Islam’. How can the faith based on JESUS be destroyed and then HIM having reverence for Islam later? How can the Jews be destroyed if the prophecies about them is not done? SHALOM…Wilbur. The Antichrist in Islam is known as ad dajjal… The coming of Antichrist is one of the major signs of Qiyamah or the Day of Judgement… It is prophesized that Jesus Christ will return to earth and fight the anti christ. Islam does accept Jesus, son of Mary ( not son of God) as one of our prophets. We believe he did not die on the cross, but was raised to the heavens by Allah. Injeel – Gospel the bible of Jesus, Injeel we believe that the word anti Christ is what is a translation to you from the original language of armaic then to Greek. Original bible doesn’t say Christians or Christ it’s esah or yeshua and the people were called essaiy or yeshuai and for opposite of esah it be the dajjal you didn’t find a translation of that so people of time kept it anti Christ. so did you have original bible with you there? Jesus said I have not come to start a new religion but I have come to fulfil the old one ( there is no reason to say that Jesus Christ created Christianity ) the Jewish where given the promised land but because they abused the Torah they where exiled it is they that betrayed Jesus Christ the saviour!!!!!! Even if all proof was to be put infringe upon humanity you would not believe it to be true!! You have no ethnicity does the Torah teach to kill they neighbour and steal their possessions and land and unjustly condemned to death? Are not going to be judged will you never die ? What answer will you give on the day of judgement when you meet your creator? Please give me some verses from the Quran, where it is mentioned Old books or verses were changed by Jewish or Christians? So woe to those who write the “scripture” with their own hands, then say, “This is from Allah ,” in order to exchange it for a small price. Woe to them for what their hands have written and woe to them for what they earn. Surah Baqarah verse 79 (2:79). This is one such verse. Well thats all about almighty Allah what eva he decides or say will happen instantly!! 1st alcohol was halal than quran made it haram !! 1st hundreda of marraiges halal and than islam make it 4 halal !! He is superior what eva he wants so eveyone shall obey there 10000 of exmples i can send u !! David said about him: “ ‘I saw the Lord always before me. Because he is at my right hand, I will not be shaken. “Brothers, I can tell you confidently that the patriarch David died and was buried, and his tomb is here to this day. I invite you to read the Christian Scriptures, which refer to Jesus as “Christ” more than 500 times. Firstly the sentence about Jesus son of Mary killing the Antichrist is from Hadith, I.e. the sayings of Prophet Muhammad (peace be upon him). It is not from the Quran. Secondly “Antichrist” when mentioned in Islamic prophecies is a translation of “Dajjal”, which means a great deceiver. It is usually translated as “the Antichrist” because this is what he (dajjal) has been called in English, as mentioned in Christian prophecies. Christ means the “annointed one”, which refers to Jesus. Islam accepts Jesus as a prophet of God. Therefore there is nothing contradicting Islam’s teachings in calling Jesus “Christ”. Islam only prohibits calling him God or son of God. Thirdly in the prophecies it is mentioned that “Jesus/the Messiah/Christ” will come and defeat the Antichrist. For this reason also he is called Antichrist, since he would fight Jesus in the latter days. As for the sentence “Allah will perish all religions other than Islam”, it’s not from the Quran either. I honestly do not know where you got it from. Jesus replied, “Blessed are you, Simon son of Jonah, for this was not revealed to you by man, but by my Father in heaven. That is also what Jesus’ chosen Apostle Peter preached (Acts 2:22-36) and taught (1 Peter 1:3). John was another disciple Jesus chose to witness and testify to what Jesus did and taught. John testified to Jesus being the “Christ” with reference to Jesus’ death and resurrection from the dead (1 John 3:16). Based on your reference to alislam.org, it looks like you are a follower of Mirza Ghulam Ahmad. Have you seriously considered how wrong he was about Jesus’ death on the cross and statements he made about the Gospel of Barnabas? Wilbur I am no scholar. With my limited knowledge, ‘Antichrist’ is merely a symbolic name for someone against the message of Allah. ‘Message of Allah’ at the time of Prophet Moses(peace be upon him) was what he said and practiced later at the time of Prophet Esa Ibn e Maryam(Peace be upon him) which you call Jesus was what he said and ordered to practice but both were only for their respective times as Christians and Jews exploited the religion and made changes. The coming of (Jesus) Prophet Isa son of Maryam(peace be upon him) would also be to clear this confusion he will say to christians that they changed his message. Allah knows best!! Abraham, Moses or any Biblical prophets has nothing to do with Muhammad or his religion called Islam. Abraham and his descendants were are by race Hebrew they worship a true God called in Hebrew Elohim, who revealed Himself not only to the prophets but even to ordinary worshipers. All prophets came from the Hebrew background and descendants of Abraham. Whereas Muhammad came from Arabs who speaks Arabic and use to worshiped 360 god and goddess at Kaba Mecca Audi Arabia. Hebrews are highly qualified and civilized race and whereas Arabs were nomad or gypsies uncivilized idols worshipers even during the time Muhammad. Bible were written by qualified prophets and messengers, in Hebrew and Greek languages. Non of the Biblical Prophets ever worshiped a god called Allah. All Prophets came from Abraham? He isn’t the first prophet, Adam was. The word “anti” means to be “against” so those who are against Christ are called the antiChrists. Jesus will come before last day and dwell among muslims and suffer a notmal humen death beacuse he never died on cross…..he never claimed to be God or son of God. Thank you for your comment. Jesus said and did many things evidencing the fact that He is the Son of God. In fact, it was this claim that led the Jews to hand Him over to the Romans to be crucified. I invite you to read the gospel of Matthew. When was the gospel of Mathew written ? Since the times of the early church fathers, the apostle Matthew has always been accredited with the authorship of the first gospel (canonically). Even the title “According to Matthew” (KATA MAQQAION) is found in the earliest manuscripts, and was the most highly regarded and quoted of the gospels by the church fathers. Matthew is also called Levi (Mark 2:14; Luke 5:27), and was the son of Alphaeus (Luke 5:27). He was a tax collector (telwnhV), probably stationed on a main trade route near Capernaum where he would have collected tolls for Herod Antipas from commercial traffic. Additionally, being a tax collector might better qualify Matthew for his role as an official recorder of the life and actions of Christ. After the resurrection there is no other mention of him in the New Testament. Various estimates have placed the date of Matthew’s composition anywhere from AD 50 – to AD 100. But before a date can be decided, its relation to the Gospel of Mark must first be addressed. If Mark was written first, then Matthew must have a later date (and vice-versa). The most widely accepted hypothesis is that both Matthew and Luke used Mark as a source for various reasons. Matthew even reproduced about ninety percent of Mark, while Luke reproduced about sixty percent. Without going into much detail on the dating of Mark’s Gospel,  it was probably written somewhere between AD 50 and AD 55. Consequently, Matthew’s Gospel could have reasonably been written anywhere between AD 55 and AD 60. This date allows time for Matthew to have access to Mark’s Gospel, and suggests that he completed the Gospel before the destruction of the temple in AD 70, because it would seem strange for the author not to mention this event in light of chapter 24. This dating also allows time for Luke to use Matthew’s Gospel in composing his own Gospel, as well as its sequel (Acts, ca. AD 62). Though dating the Gospel maybe difficult or complicated, it is even more problematic to determine where Matthew wrote the Gospel. Most scholars conclude that Matthew was written in either Palestine or Syria because of its Jewish nature. Antioch of Syria is usually the most favoured because many in the early church dispersed there (Acts 11:19, 27). Another reason for favouring Antioch is that the earliest reference to Matthew’s Gospel was found in Ignatius’ (the Bishop of Antioch) Epistle to the Smyrnaeans (ca. 110). It is quite obvious and widely accepted that Matthew was written to the Jews. For one, he focuses on the fulfillment of the Old Testament, even quoting from it sixty-two times, which is more than any other Gospel writer. Secondly it is interesting that Matthew does not explain Jewish culture like the other evangelists (cf. Mark 7:3, John 19:40), which also adds to the argument that he is writing to Jews. Matthew uses the phrase, “kingdom of heaven,” (the only author, in fact, to use this phrase) which can be considered as a “reverential Jewish expression” -a term appropriate to a Jewish audience. His purpose in writing to the Jews was to show them that Jesus of Nazareth was the expected messiah and both his genealogy and his resurrection were legitimate proofs of this. The overriding theme shows Jesus as the messiah, but there are also several minor themes, some of which directly relate to the major theme. These other themes include the kingdom of heaven, the conflict between Jesus and the religious leaders, Jesus as the fulfiller of the law, and the king who will return in the clouds. A.W. Argyle. The Gospel According to Matthew. (London: Cambridge University Press, 1963), p. 1. Michael J. Wilkins “Disciples” in Joel B. Green, et al Dictionary of Jesus and the Gospels. (Downers Grove, Illinois: InterVarsity Press, 1992), p. 180. Robert Mounce. Matthew. (Peabody, Mass: Hendrickson Publishers, 1991), p. 1. Ralph P. Martin. New Testament Foundations: Volume 1. (Grand Rapids: William B. Eerdmans Publishing Co., 1975), p. 240. Robert Mounce. Matthew. (Peabody, Mass: Hendrickson Publishers, 1991), p. 2. See Introduction to the Gospel According to Mark. R. E. Nixon. “Matthew”; in Donald Guthrie, et al., The New Bible Commentary: Revised. (London: Inter-Varsity Press, 1970), p. 814. As R. T. France points out, it is important to know that in Matthew’s case, “the main divisions are still debated” amongst commentators. Matthew. (Grand Rapids: William B. Eerdmans Publishing Co., 1985), p. 56. See R. E. Nixon. “Matthew”; in Donald Guthrie, et al., The New Bible Commentary: Revised. (London: Inter-Varsity Press, 1970), p. 813. Instead of trying to prove religion, do the best for today and tomorrow. Peace be with you. Amen. Love you all, I can love this world not only by words,but by sense,heart and soul as well by daily actions. I can tell this because I have my God in me, if you have don’t speak so in actions only filled with God. If you really love and respect God then do love your people of Earth who are visible so the invisible God be seen to You. Thank you for taking the time to comment, “Anonymous.” Do Muslims believe Jesus’ death on the cross? If you believe Jesus’ teachings, you should believe that He died on the cross and rose again from the dead. This is something Jesus taught in the gospels (Matthew 16:21; 20:17-19; 26:1-2, 6-12) and happened in history. One of Jesus’ foremost disciples was Peter. Jesus appeared to Peter after He died and rose again. Peter testifies to Jesus’ death and resurrection in 1 Peter 2:24; 3:18. Another disciple, John, testified to Jesus’ death and resurrection in 1 John 2:1-2; 4:10 and Revelation (Rev.1:1-18). Followers of Jesus who knew eyewitnesses also spoke about Jesus’ death and resurrection include Luke who wrote Luke and Acts (see Luke 23-24; Acts 1). Jesus gave a sign to the church (the Lord’s Supper) to commemorate His death. In my studies, I have found that it is the followers of Muhammad who changed the teachings of Jesus and His followers. I think there is a great problem with the Islamic view of Jesus. Muslims say “we love Jesus”. Jesus said ” Jesus answered and said unto him, If a man love me, he will keep my words: and my Father will love him, and we will come unto him, and make our abode with him.” (John 14:23). Notice that John was one of His apostles: is is contemporary to Jesus, he was with Him, talked with Him, and it was himself who wrote this book after Jesus died, later in his life at the island of Patmos. There was no reason whatsoever for John tell lies, of course. For a logical point of view, if Muslim brothers love Jesus, they will need to keep His words. And to keep His words means that they accept Jesus as a the son of God (“my Father will love him”). This creates a great contradiction with what Muslims believe: that Jesus was not the son of God. So if Muslims love Jesus, they need to accept that Jesus is the Son of God. On the other hand If they don’t believe He is the Son of God, they do not love Jesus because Jesus Himself told He was the son of God.